Well, here it is - it's official. I'm no longer scared of sewing and using a sewing machine. This machine is a bit special actually. 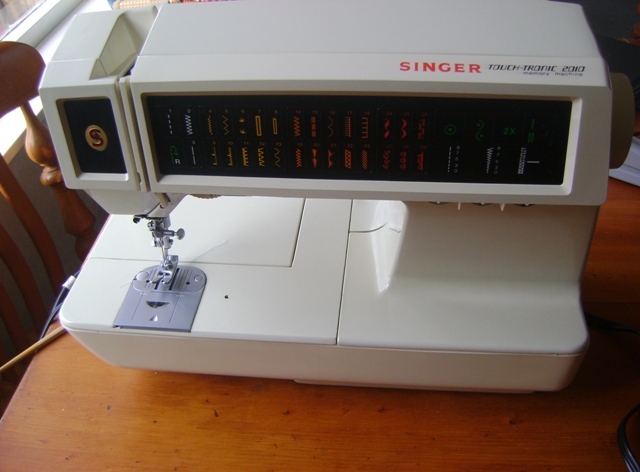 It's a Singer Touch-Tronic 2010 and they've never been sold in NZ or Australia...just one of the reasons why the couple of sewing machine servicemen I've visited have said that they won't service it. As well as that, it's made in the US (in 1983), so needed a special transformer. Oh, and I am yet to track down more bobbins for it, they don't appear to sell bobbins that fit it in NZ either. But it's a lovely old machine with fabulous stitches and a self winding bobbin and all that. VERY cool! The first things I attemped were a few bibs (my first ones are the ones on the left) - after these ones though I realised there were a few things I could do to hide where I'd turned them in the right way - and so then I whipped up the ones on the right (which are lined with towelling as well for extra absorbency) and fleece backed. I'm pretty happy with how they turned out! Oh, and the ones below are actually for Timothy. 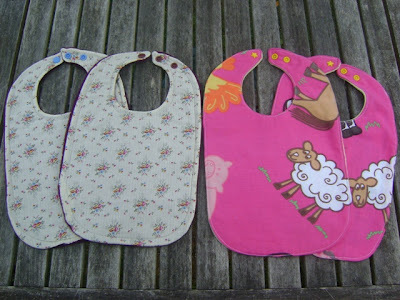 It's true, for the last 2 years, his best best bibs have been ones with pink handbags on them. 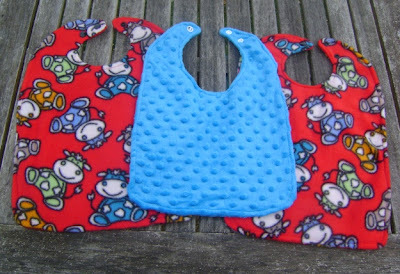 I decided it was time he had some slightly more masculine ones (funnily enough, although the blue minky one looked fabulous on him tonight he kept trying to rip it off as he couldn't tuck the bottom of it in under the edge of the table. The red cow ones are modelled on his handbag ones and so he was much happier wearing one of those). Very cool! I love sewing and knitting, can never decide which I like better. Awesome :) You are, of course, a natural! your stuff is gorgeous. My two year old would look adorable in that little pink knitted dress(size 2). thanks!